Gunnar Ploner is invited guest critic to the final presentation of the Studio of Karen Lohrmann at the Faculty of Architecture in Innsbruck. 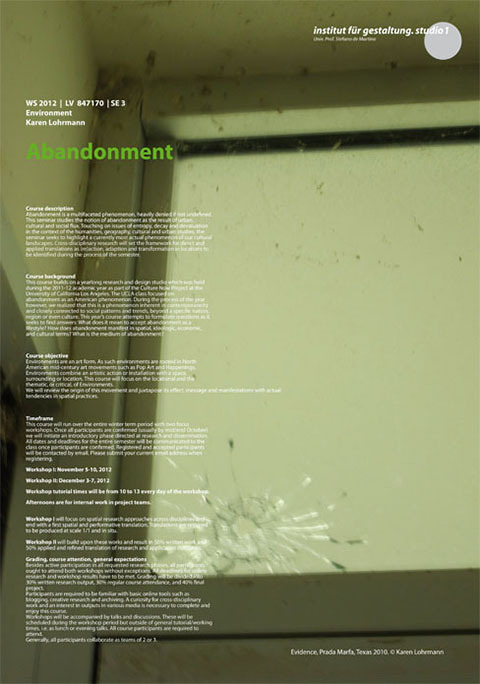 Course description: Abandonment is a multifaceted phenomenon, heavily denied if not undefined. This seminar studies the notion of abandonment as the result of urban, cultural and social flux. Touching on issues of entropy, decay and devaluation in the context of the humanities, geography, cultural and urban studies, the seminar seeks to highlight a currently most actual phenomenon of our cultural landscapes. Cross-disciplinary research will set the framework for direct and applied translations as (re)action, adaption and transformation in locations to be identified during the process of the semester. Course objective: Environments are an art form. As such environments are rooted in North American mid-century art movements such as Pop Art and Happenings. Environments combine an artistic action or installation with a space, surrounding or location. This course will focus on the locational and the thematic, or critical, of Environments. We will review the origin of this movement and juxtapose its effect, message and manifestations with actual tendencies in spatial practices.